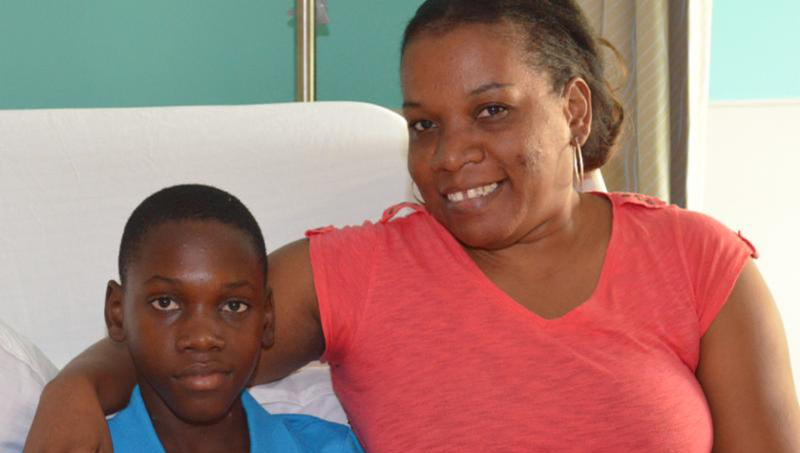 CAYMAN ISLANDS (October 25, 2015) – A relieved mother from St. Kitts and Nevis is grateful for the doctors and staff of Health City Cayman Islands and its partners following the successful cardiac treatment of her son. The patient, 12 year-old Phesaun McCalmon, was treated for an Atrial Septal Defect (ASD), a “hole” in the wall that separates the top two chambers of the heart. The surgery was performed by Dr. Binoy Chattuparambil, a senior cardiothoracic and vascular surgeon with more than 20 years of experience, and cardiac surgeon Dr. Sumit Modi. Shellon McCalmon was impressed with Health City’s attention to patients and those who accompanied them: “Your kindness, most of all, was very warming and we felt welcome,” she said. The Kittitian mother was particularly appreciative because the surgery and hospital stay were provided at no cost to her thanks to the collaboration between Caymanian and international charities. Local charity, Have A Heart Cayman worked with the World Pediatric Project to bring the ailing youngster into the care of Health City Cayman Islands. “We were very excited to be able to send our first patient to Health City Cayman Islands,” said Susan Rickman of World Pediatric Project. “We are also looking forward to a long and successful partnership with Health City as we strive to provide quality healthcare for kids around the world,” she added. “This was my first experience working with Health City Cayman Islands,” said referring pediatrician Dr. Ian Jacobs in St. Kitts. “The professional service they provided was excellent, and the support they gave to my patient and his mother was wonderful,” he added, noting that the doctors kept him informed with regular updates throughout the process. Since opening last year, Health City has performed surgeries for numerous children from Haiti free of charge in collaboration with partners such as Digicel and Have a Heart.